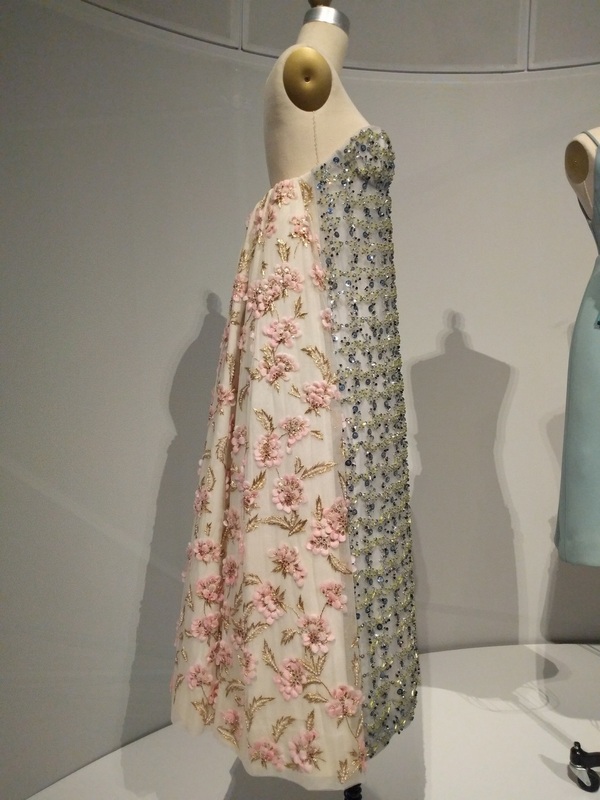 This last weekend when visiting friend in New York City, I had the chance to attend the opening day of Manus x Machina, the Metropolitan Museum of Art’s latest costume exhibit sponsored by Apple. The exhibit curated by Andrew Bolton focused on the interplay of handmade and machine-made clothing relevant in the fashion world. It displayed garments from early twentieth century up until last season with alcoves dedicated to different techniques: embroidery, pleating, artificial flowers, 3D printing, and more. Surprisingly the attendees of the Met Gala wore more wearable technology than the exhibit showed. In Bolton’s words, "wearable technology is something I am very ambivalent about [...] I think the biggest problem with wearable tech is the aesthetics of it and the fact that it is really just there as a gimmick, as opposed to something that has a realistic application in terms of fashion," which I can’t say I don’t agree with. In Manus x Machina the machine-related discussion was more around technological advancements in traditional fashion like synthetic textiles, machine embroidery, and heat transfer application. The most “state of the art” methods were laser cutting and 3D printing, no fiber optic woven fabric or embedded circuits like we think of wearable tech today. The main topic posed by Bolton was the value we place on handmade garments. Haute couture has always been considered the most valuable fashion because of the incredibly skilled craftspeople that create it. What Bolton showed was that machine-enhanced clothing can foster more creativity and create truly unique clothing that is just as valuable as a Lesage-embroidered gown. Though that’s not to say it’s purely a hand vs machine discussion for many of the garments featured both. The centerpiece of the collection, a Chanel wedding gown, featured a synthetic neoprene fabric with hand-embroidered train while the pattern of the embroidery itself was developed by a computer. In the exhibition book, Bolton cites Fritz Lang’s Metropolis as inspiration, in particular, the epigram at the beginning and end of the film that reads: “The mediator between the HEAD and HANDS must be the HEART.” Bolton notes that it could have equally read: “The mediator between the HAND and the MACHINE must be the HEART.” It doesn’t matter if it was made by hand or machine, it’s the ideas and the care taken in the creation that makes something valuable and inspiring. Hand embroidery is one of the finest examples of couture savoir-faire. Chanel has been purchasing the main embroidery houses in France to keep the tradition alive. Atelier Lesage was featured heavily in the exhibition along with other ateliers. Business of Fashion has a great interview with the famed house if you are interested in learning more. I also found that they still teach classes in case you ever want to take a summer to learn traditional embroidery in Paris. Sequins are actually a surprisingly recent innovation (on the order of 100 years as opposed to embroidery’s thousands) that was featured heavily in the exhibit. A few of the dresses even had gelatin sequins which I described in this post all about the origin of sequins. Gelatin sequins were an innovation in the 1920s that allowed sequin garments to be much more lightweight. Unfortunately they melt when heated so they cannot be washed and occasionally if a dance partner had a sweaty hand you can find ghostly handprints on vintage dresses. If you’re interested in some of the more avant garde scientifically-motivated designs, check the bottom floor of the exhibit featuring those like Iris van Herpen, Hussein Chalayan, and Issey Miyake. 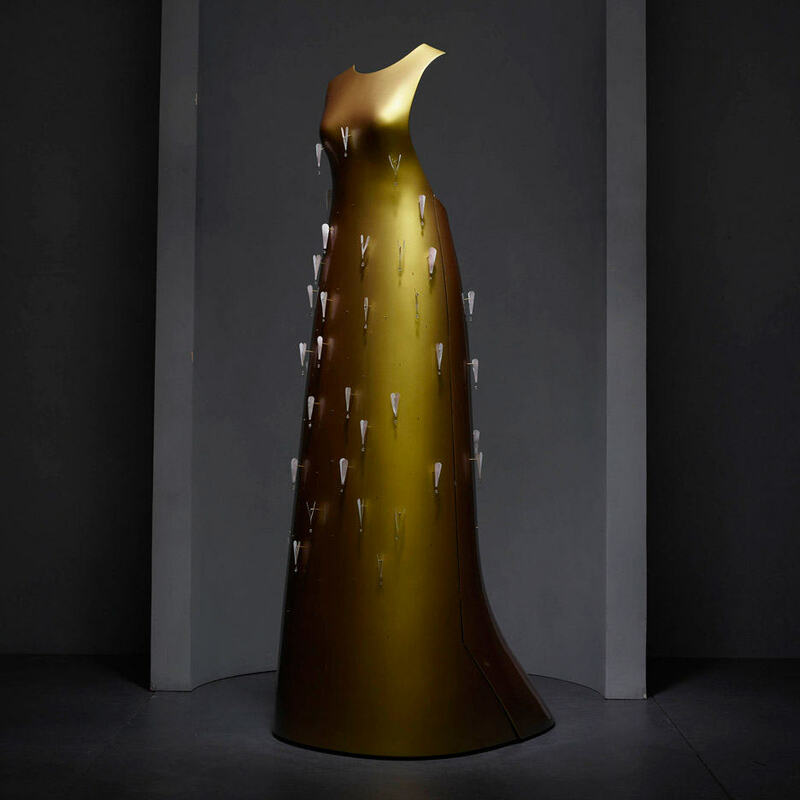 If you can’t get to New York City before the exhibit ends August 14, I suggest you check out the exhibition catalog, Manus x Machina: Fashion in an Age of Technology. Enjoyed this post? Make sure you subscribe so you never miss another.